Last night, I attended the evening Athletics session at the Olympic Stadium to see the climax of what was aptly named ‘Thriller Thursday’. Before I had even arrived at the Olympic Park there was already an incredible buzz surrounding the events that would take place that night and especially the T44 100m final. A few weeks ago, when I purchased my ticket for this session, I’ll admit that I was excited to see Oscar Pistorius win a gold medal at London 2012. It wasn’t to be. Instead, Thursday evening gave the British public a night to remember. Our three protagonists, Hannah Cockroft, David Weir and Jonnie Peacock all took gold and sent the 80 000 strong crowd into a frenzy. First, it was the turn of Hannah Cockroft, the 20-year old from Halifax. As she was poised at the start for the T34 200m final, the crowd were expectant. She had dominated in the heats, was the outright favourite and the race did not disappoint. Cockroft lead from the start and as the crowd stood in admiration, she stretched out way ahead of her competitors before crossing the finishing line. Her performance was both spectacular and imperious and stands on its own as one of the sporting moments of these games. Yet, this special night had only just begun. Hannah Cockroft celebrating her T34 400m victory. 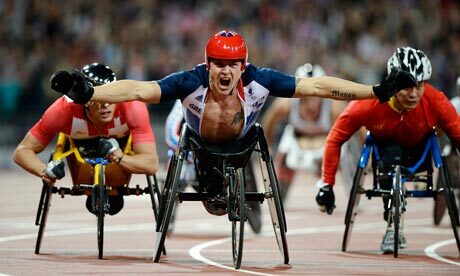 There is not much more that David Weir can do to become a national hero after these Paralympics. He secured his third Paralympic gold of London 2012 in style. Staying close behind Zhang Lixin for much of the race, the ‘Weir Wolf’ was spurred on by the wall of noise from eager spectators as he came into the home straight. At this point, the crowd had reached full voice and the British star managed to take the lead and grit his teeth up to the finish line. His image in victory will surely be one of the most iconic of London 2012. David Weir celebrates winning T54 800m gold. So, two GB athletes had already thrilled the British fans but there was still one race to come, the T44 men’s 100m final. With Bolt, Blake and Gay out of sight it was time for Jonnie Peacock to battle against the dominant Oscar Pistorius and the American Richard Browne. After a false start from the 200m champion Alan Oliveira, whose win caused the now infamous outburst from Pistorius a few days ago, the whole stadium was heard chanting Peacock’s name. The starting gun fired and he burst through the field in 10.9 seconds, a new Paralympic record. 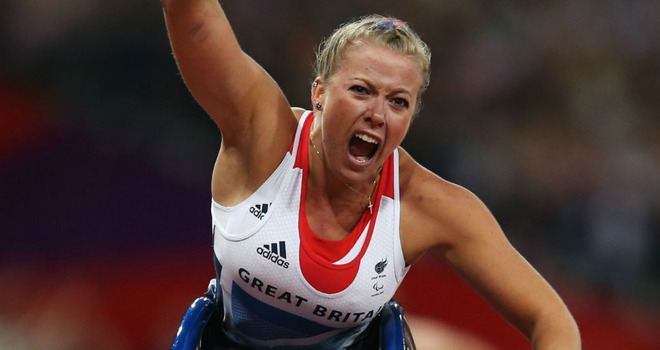 Pistorius missed out on a medal as he finished in fourth and it seemed that Britain had found a worthy successor. 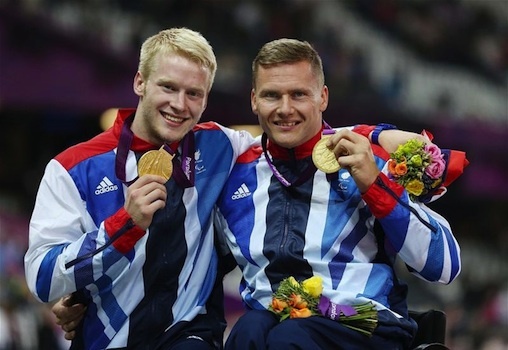 Jonnie Peacock and David Weir celebrate with their gold medals. For those who were in the stadium, it was unforgettable. I think that last night typified the Paralympic spirit that we have seen from spectators at London 2012. The positive atmosphere was what I had expected, as the audience clearly respected the achievement of each and every athlete that competed in that stadium. However, these Paralympics have been special because the British public have embraced them as pure sporting entertainment. The stories are inspirational but once the competition starts all is forgotten and the contest becomes the main story. Last night, the sense of anticipation just moments before Peacock began his race was uncontainable. For me, that is the symbol of recognition that the London 2012 games has brought to light. Hi Joanna! I was there that day too…I think you’ll agree it was an amazing experience! You’ve been following me for a little while now and I would love it if you could comment on my post. Thanks Katie! It was a great sporting event. Look forward to reading your posts on Pistorius. I’m sorry Joanna, I sent this from my crime and politics blog not my sporting one. You will need to click on here for it to work. My post is now up. Any comments or requests would be greatly appreciated. Thank you!